Vagelis Giotopoulos FSWPPThis shows the qualification attained by Vagelis Giotopoulos within the SWPP and associated societies. Vagelis Giotopoulos has an Exhibition here. My photographic style: Photojournalism- modern style, extreme poses, love the TTD (trash-the-dress) photography! My greatest strengths: Full artistic vision and perception, flexibility, innovation. 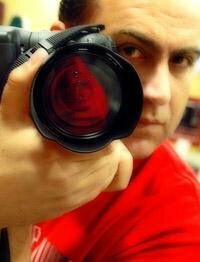 I have been in photography: 25 years. Started in 1983 as an amateur and become professional since 1987. How I got started in photography: I started as an assistant at my father's-in-law company. My photographic skills: Passionate, patient when requested, innovative. My personality: Confident, capable, hard-working with lots of passion for my job. Geographic areas I cover: All around Greece, especially Epirus (Ioannina, Preveza, Arta, Igoumenitsa), Lefkas and Corfu too, Athens, Patras, Salonica. If requested I travel within Greek islands, or anywhere around Europe too. Venues I frequently attend: I prefer urban places- a city park, the stadium, a big avenue. But in some occasions the romantic element is required too, so I'd choose to shoot by the sea/ coast, at a castle or during the sunset. I found inspiration from: The wedding photographer that inspires me most is Yervant. During my life and job, what inspires me most is my everyday-life itself: my family- my two wonderful children who happen to be my partners too, the small city I live in, my father's village that locates on a mountain with lots of natural beauties! Success in photography: My biggest success so far is the award: Fine Art Photographer of the Year 2010, from SWPP. 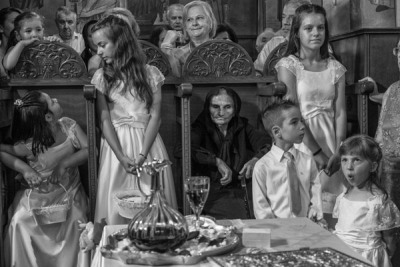 Another great discrimination is the second place in the IPA's Wedding category in 2009, and the 1st place in Wedding Photojournalism Category for 2010, from the Greek PWS. Every month I participate in SWPP's contests, where I've managed to obtain several gold and silver medals, and I'm proud of that! Photographic training: Degree from "Focus School of Art Photography", Athens-Greece. Have attended at the SWPP's annual convention both in 2009 and 2010. Attend about 10-15 seminars about photography from International photographers in Greece, every year. Why I like the SWPP: I like that it's a serious society, very well-organized, certificated and well-recognized by people inside and outside photography! I love that I've been given the chance to meet so many photographers through SWPP, that have advised and helped me to evolve. It's great to be given the opportunity to discuss and communicate different opinions with colleagues and NOT see them as competitors, but become good friends! Future plans: It's been only a few months since I started a new studio with my son Alexandros, so my plans for the future is to focus on this and do lots of studio workshops and wedding photography together with my son so as to teach him from my 25-years experience, but be taught too, as he is a very modern photographer, cause of his young age!